What makes your blog popular? A design that promotes readability? Those are all important, but there is something else. Something nobody talks about. Because it’s so hard to put your finger on. Let me explain by telling you about one of my dreams. I’ve dreamed about opening my own restaurant for a long time. A tapas-style menu. With Spanish dishes and a few of my Asian favorites. A good wine list, plus a decent selection of beers from across the world. I’d have simple wooden tables and chairs. An eclectic mix of art and photographs on the wall. Or maybe I’d ask the local school for a few children’s drawings each month. When we think about our blog, we tend to think about material things, too. Topic selection, fonts, colors, writing style, post structure. And as good marketers, we think about our audience. What would they like to read? Which tips would be helpful to them? Which problems are they struggling with? These blog considerations are relatively straightforward and simple. You write about copywriting or content marketing or both. You choose a serif or a sans-serif font. Sure, these choices can be hard to make, but at least they’re concrete. Let’s think about my imaginary restaurant again. There’s something far more important. Something that’s more difficult to describe. It has to do with atmosphere, feeling, and personality. Yes, the interior design has an impact on the atmosphere in the room. And so has the music, but what about the welcoming feeling? Why does the restaurant feel familiar and homey even if you enter for only the second time? A restaurant can exude a certain poshness. Bristling white linen. Delicate food on giant white plates. The waiter who keeps at just the right distance. Maybe a few awards hang on the wall near the entrance. Or the restaurant can be fun. There could be a surprise menu. A free cake if you can prove it’s your birthday. Loud music and a lot of laughter. Or you can have a local pizzeria with photos of the owner’s ancestors who had a trattoria in an Italian village. The menu explains the origin of the dishes. The olive oil is specially imported. And at the end of the meal you get an aged grappa from the house. The atmosphere in your restaurant isn’t just about the décor, the menu, and the music. It’s about a lot more… the twinkle in your eye, the stories you tell, the welcoming smile of a waiter. In the real world a disproportionate amount of value is placed on the tangible. Things we can easily explain, or put our finger on. A good restaurant doesn’t just fill up your stomach, it’s also about the experience, about having a good time. What’s the feeling you want to create with your blog? Homey and welcoming? Or maybe a bit rebellious? Or a strong voice of authority? Or super-slick? The feeling on your blog is about the way in which you answer comments (or not). How you ask questions in your blog posts. Whether your blog posts feel intimate or lecturing. It’s about the stories you tell. The metaphors you use. The words you choose. It’s about how you inject your personality into your blog posts. Whether you sound bored or full of enthusiasm. When I started Enchanting Marketing in November 2012, I thought I just needed to write super-useful blog posts. Long list posts. In-depth information. Because I thought creating a blog is about building authority. Yes, being useful and helpful is important. But blogging is about intangible matters, too. How do you inspire your readers? How do you make them feel better? Think about my little restaurant. The music, the menu, the décor – they all influence the atmosphere. But I’d want you to come because it’s my place. Because you’d like me to say hello to you and linger at your table for a chat. Maybe we talk about your work. Or about the latest blogs we’ve discovered, the books we’re reading. Maybe you’d ask me about my next cycling holiday. Plenty of blogs share useful tips about the same topics you and I write about. If you just share tips, it’s easy to swap one blogger for another. To build a loyal audience you need to truly engage people. Your readers need to come back because they like you. They smile at your stubbornness. They forgive you for a badly written post. They shake their heads about your latest crazy idea. They wait for your next email to arrive in their inbox. The secret ingredient of your blog is you. You’re the only one who can make your blog really work. By telling a little more about yourself. By sharing your enthusiasm or your doubts. Readers don’t just read your posts for your tips. They come back to be inspired. They come back to “hear” your voice. They come back because of you. Definitely need to find that ‘ooomph’ or ‘aha’ that connects to your readers. I think in this connectivity age it is beyond the sharing of information and about the sharing of experiences and stories. I (wining & dining addict 🙂 ) love the comparisons with food and restaurants. It’s lively, expressive and intensifies the meaning of your post. Yep, so true: Good food connects. Thank you for your brilliance! Yep, shock jocks can create a lot of interest especially – I assume – because their headlines draw a lot of attention on social media. But I wonder… how often do their readers return? Are there any bloggers you dislike that you still follow on a weekly basis? Whoa! Its the blogger.. her personality.. her way of thinking which influences her readers! PS: When I come to your blog, I feel calm. The hustle bustle of online marketing and cut throat competition of blogging cease to exist.. The words pacify me, and help me make a smart decisions..
PPS: Any plan of implementing Google+ comments? No plans on Google+ comments. Do you think I should? I love the way you tell the story Henneke. It’s a real inspiration – I will work on being able to do the same. Thank you, Zsuzsi. Let me know how you get on? This is definitely “Marketing 101″…and what I can’t get over is the time consuming nature of blogs and keeping up with one. Granted, it is easier to do when people (readers) are your audience and you know they visit your page every day or so. Blogs become as comfortable as favorite radio stations and their On-Air personalities to their devoted listeners. That’s definitely what we “literary” types are striving for, given the chance to inform and entertain. I’m sure if you went to G+, you would soon have an audience there, too…. I see you’re a cycling enthusiast, too. Just mountain bikes or hybrids, too? What IS the atmosphere in your restaurant like.. I can’t decide.. It’s not all white linen but it is not plastic table covers either.. whaddayathink? Yep, somewhere half-way. I’d like to think quite simple, quite peaceful, and natural. A bit traditional with a few weird, bold, or artistic touches maybe? The people are more important than the decor. 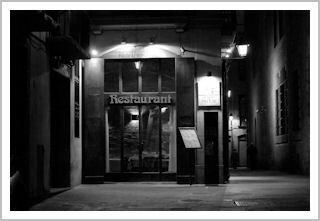 Are we talking about my blog or my imaginary restaurant? Those, as you well know, are the same. I am glad you are getting more and more personal on your blog. I think only a mix of personality and information works. So – I fully agree. When you said before you weren’t sure about the atmosphere, do you think the overall feeling, the personality is not strong enough yet? Nice article but you might want to check your use of “HOMELY” which means unattractive when you should be using “HOMEY” which means comfortable and inviting. Since both words are real words, your spell check would not have caught it. Oh no, I never knew there was a difference between British and American interpretations for the word homely. In Britain homely does mean cosy, comfortable (like one’s home). But I better change it, as I can see it confuses my American readers (who are in the majority). Ha, it not only confuses them, they get mighty upset. As I have experienced mahself! I think you’re right about the effect of using this ‘secret ingredient’. But: it takes courage to use it. I think its easier to write about what I think my audience wants to read. But when I write more personal posts, I also find people like them a lot more. Perhaps the real ‘secret ingredient’ of a good post is courage? Yep, I agree – writing in a more personal way and showing who you are takes some courage. In the beginning I found it really scary to blog and initially I preferred to hide behind useful tips. For me it’s been a slow process of finding my voice. Henneke. You rang the bell . The secret is “voice.” Which is scary. We all have a sound. When we speak or write they hear us. Our voice comes through no matter what. One person could read a phone book aloud or write a mundane piece and we listen. The next person could offer the keys to the kingdom and we turn away– from the sound. No way to fake it. If we try, we wind up with the same tired sound of the cliched voice. Yes, that’s so true. When we speak it’s so natural to have our own voice, our own way of saying things. But when we write, it’s so easy to fall into the trap of clichés and hide our own unique voice. I don’t know why. When people read what you’ve written, they should almost be able to hear your voice. Henneke. Credit where credit is due. Once the connection, which you established with your give away and Henneke relational responses. Yes, they were plural. You still had to get me back. How did you do it. Once the relational/voice Henneke is a real person was established, you hooked me back in here with your e-mail. Layout. Simple one liners that were again filled with your voice. I had seen other one liners. They sounded like they were machine written. NOT yours. Then that “secret.” What we will all give for the “secret!” That’s why I showed up and read and responded. Oh, and by the by, you do know the secret. I’m new here but will be coming back for more because your voice spoke to me! It’s an interesting one because this is the one thing that can’t be taught – you can’t teach someone to have personality, only to develop their voice and allow themselves to shine. Yes, good point. You can’t change someone’s personality, but you can encourage people to be themselves and show more of their unique personality when they blog. Is the blogger’s voice that of the author or what the blogger believes the readership prefers? Is not the process of discovering the nature of the readership an evaluation of their preferences? Can a blogger risk conveying a genuinely true voice if to do so is to risk alienating the reader? The shock-jock might manipulate his readership by perversely writing with a counter- voice so as to cultivate controversy. But he weighs up his readership no less than the blogger who courts consensus. A blogger may nuance the text for the comfort of the (trans-Atlantic) readership . The voice of the blogger may be welcomed or rejected, found inspirational or dispiriting. But it will be a constructed voice – like it or lump it. To some extent a voice is always constructed of course. You pick the parts of your voice you like and disregard what you don’t like. You see how others write and include some influences in your own voice. But I do think that blogging is different from copywriting. Blogs tend to be better with a strong, personal voice. Sure, you can hire someone to blog for you, but that never works as well as learning how to blog yourself. If you’re WalMart of another big company you may adjust your voice to your audience. You hire the writers that suit your company image. But in the case of small business owners – especially if they provide services – they can pick the audience and the customers that suit their personality most. They should try to attract the audience that likes them because of who they are. I agree, the secret ingredient is you and your own style, just like your restaurant should fit you like a glove. I’m reading some blogs about copywriting or better writing but yours is really enchanting and at the end of a post a reader feels he has learned something, without having been lured to do something. I’m with you in that. That’s what I’m in the process of experimenting with my own blog. And speaking of experiences (I also agree with Azzam), just the other day I published an article in Huffington Post that’s gone viral beyond my expectations! (I’m not sharing the link here unless I have your OK). All because I shared my own story of the “before” and “after” a layoff that resonated with so many. Clearly this is what makes readers tick these days. Thank you for another great post, Henneke! Great article, Anca. I admire your courage to write that. Well done! I recognize a lot of your points. I consider myself lucky to have left the corporate world (only 10 months ago!). It’s so much better to be working for myself. I’m so much more relaxed and happier – still working hard, but it’s giving me energy. Yes, I decided to go public and share that experience. It wasn’t easy, but it was therapeutic. And I was (and still am) completely blown away by the response. Going back to the essence of your post, sharing something about yourself that would be meaningful for your readers does really make a difference. You’re absolutely right of course, but at the same time is something like personalty also very difficult “to manage”. What I mean is, that you have it or you have it not, and if you don’t have it, then what do you do? Quit? Or try to make the best of it, by following good examples of others and try to at least make the best out of it? That’s an excellent point. I’d say that everyone has personality, but often people hide who they are. Sometimes they hide themselves only when they write, sometimes also when they talk in “real life”. Some people are quieter than others, but that doesn’t mean they don’t have personality. When people struggle to translate their own voice into writing, then I recommend they study how other bloggers write. Find two or three bloggers that you feel connected with, that feel familiar because you can relate so well to them. Start with imitating their voices. Everyone imitates badly, so you automatically start developing your own voice. So yes, as you say – follow good examples, but make sure you pick the examples that suit you. I truly love the way you write and think, Henneke. And yet again, you’ve hit the nail square on the head. And while I agree with what you’re saying about blogging, it applies perfectly to marketing in general. Now, I need to step back and see how well I apply these thoughts and ideas to my own business. I sure do hope that my blog posts, my website in general, and the way in which I conduct myself with clients and prospective clients is in line with these ideas. Great points in this article, Henneke – thank you! I love receiving your updates! Yep, that’s so true. After all, blogging is a way of marketing yourself in a friendly, non-pushy way. I like your definition of marketing! 🙂 And shall I tell you secret? Ah, you probably already know… my book is as much about marketing as it is about writing web copy. Good marketing is the basis of good copywriting. Thank you for stopping by to share your thoughts, Ted. I appreciate it. Hi Henneke, feeling the same as Mohul when I read your posts. It takes time to build the “peaceful” space on the Internet where to talk and share stuff and passion for something. Thanks! And you’re right about the time it takes to build a peaceful space on the web. It might be quicker to build a nice restaurant! Great post – I found what you shared very insightful. I love blogging however have dipped up and down with my posts – what you have shared as the secret ingredient I love. My first serious entrepreneurial venture ( too many years ago to mention) was in fact a restaurant, a vegetarian restaurant and my secret ingredient was that I infused the food I cooked with love, that was a light bulb for my blogging. Thank you. Wonderful post. I started blogging back in 2007 and back then my writing was quite dry and factual. I was still stuck in my “corporate speak” world. It took me a long time to find my voice. I’ve also found that as my business changes and as I change, my voice becomes a bit stronger with each iteration. That used to scare me. What if I offended someone? Today, I’m happy to say that I get more engagement on my blog as I am true to my voice. Thanks for the examples. They were perfect. I’ll spend some time thinking about what I’d like my restaurant to be. Yes, when moving from business writing to blogging, we all have to unlearn “corporate speak”. This can be a difficult and painful process, but eventually we’ll get there. And so many rules we’ve learned at school don’t apply when you try to write engaging content that’s also easy to read. Which high school teacher would have allowed sentences starting with And? Or one-word paragraphs? I enjoy seeing my own blog as a little restaurant where my readers come to visit me and we’re all having a good time together, with a bottle of wine or a good Belgian beer. Thank you for stopping by, Stephanie. It’s nice to meet you! Hi Henneke. I enjoyed your post and I think you are absolutely right about a blog needing to be about more than just information. It needs a distinct personality as well. I just started my second blog recently, and I’m trying hard to avoid the “corporate voice” and inject as much of my personality into my writing as possible. I think it’s about learning to trust yourself as a writer and having the courage to write authentically. It’s about seeking purity in your message and not allowing too many external influences to dilute that purity…being yourself, in other words! Yes, you’re absolutely right – it’s good to avoid the corporate voice! Being authentically yourself isn’t always easy, and you can look for outside influences to find your own voice. I studied how bloggers that resonated with me were writing, so I could emulate some of their techniques and develop my own voice. Authenticity doesn’t always mean you have to find everything within. Good luck with launching your blog, and thank you for stopping by, Neal. Wow. I’ve never heard it put that way before, Henneke. You’re right. Our blogs are like our favorite restaurants or even a virtual home we invite people into. Readers should feel welcome and hopefully entertained. I’ll keep that in mind. Thank you. I used to run a business where people came to see me once a week for a service. I had a beautiful view, overlooking mountains and water, always had tea or a treat and usually made people laugh. I was really surprised when my place became a hangout. People met there. I finally realized it was like a friendly party, not just brilliant consulting they were coming for. I’m trying to figure out how to do that in writing. You always say it so well Henneke. I do appreciate it. That’s such a nice story. Atmosphere makes a big difference, doesn’t it? I’m sure they also came for your brilliant consulting! Great post, Henneke! I didn’t see it before. ?? I’ve been going through your posts to learn how to write a good blog, or even a good article for the web. I find your writing style fun, entertaining, educational, highly valuable and enormously friendly. Your tidbits and gems of insight expressed in your unique style makes it easier to apply. They’re like gifts from the gods. Yes, they work! Thank you, Bart ??? You’re so right! I read a blog the other day and all the information was there but it just didn’t interest me – it was a yawn from start to finish. Absolutely no personality – could have been written by a robot! Thanks for a great post ? Thank you for stopping by, Angela. These days there are so many blog posts, that simply giving advice isn’t enough any more. We crave a human connection, don’t we? I think I love you, Henneke. When I read your work you sound really nice. Nice? yeah, nice. Calm and wise and yet, humble and friendly. There is a ‘nice’ feeling about your advice that urges me in that direction which I know will lead me to happiness/fulfilment.